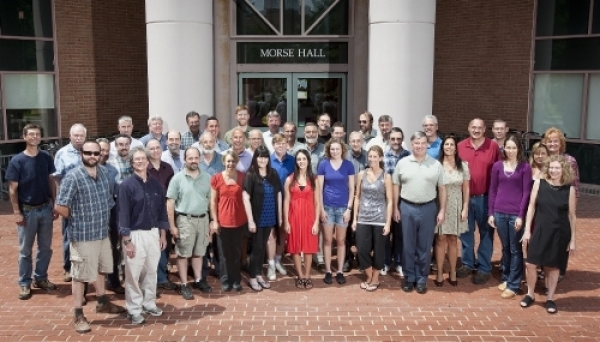 Ten years ago, UNH physics professor Roy Torbert knew that when the university’s Space Science Center (SSC) was awarded a very large role in NASA’s ambitious, four-spacecraft Magnetospheric Multiscale mission it would be a long and challenging journey for him and his team of scientists, engineers, machinists and students. Now, with MMS poised to launch from Cape Canaveral, Florida, at 10:44 p.m. on March 12, Torbert can finally catch his breath and look back on the decade-long effort with pride. He can also look forward to the pioneering science the mission is designed to do — and could not have without the skill and expertise of SSC staff. 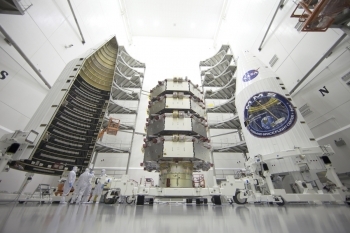 “MMS was a much bigger and taxing effort than I had anticipated, and I had anticipated a huge effort and told the team so at the time we won the award,” says Torbert, lead scientist for the UNH effort and deputy principal investigator for the MMS mission itself. At the time, the $38 million in NASA funds to build key instruments for each of the four satellites represented the largest, single research award in UNH’s history. In the end, and after taking on additional, critical tasks beyond the original contract, the university received nearly $70 million in funds from NASA to complete the job. In all, the SSC — a center within the Institute for the Study of Earth, Oceans, and Space (EOS) — was responsible for delivering 28 of the flight components and for the integrated instrument-level testing of all of these components before delivery to NASA. The mission is designed to explore the plasma processes that govern the interaction of the Earth’s magnetic field with the highly charged solar wind. Plasma is a highly ionized gas sometimes described as the “fourth state of matter.” Plasmas occupy 99 percent of the observable universe. However, only in the Earth’s magnetosphere — a multilayered, comet-shaped magnetic shield that, in its tail, extends as far as 60,000 kilometers away — are these important plasma processes readily accessible for sustained study through localized measurements. MMS will use the magnetosphere, which protects our planet from solar and cosmic radiation, as a laboratory to study the microphysics of magnetic reconnection — a poorly understood, universal process in which magnetic fields reconfigure themselves and release enormous amounts of energy that, among other things, can accelerate charged particles to nearly the speed of light, making them hazardous to anything in their path. These explosive reconnections drive much of the “space weather” in our magnetosphere and can been seen in the dazzling auroral displays that light up night skies. Space weather can also impact communication satellites, GPS navigation, and Earth-based power grids, and scientists want to understand how the magnetic explosions work, in part, to predict when they might occur and better protect the technologies on which modern society relies. “The details of reconnection are so unknown that we could find many surprises,” Torbert says. Space weather considerations aside, the quartet of satellites — flying together as a tightly coordinated, pyramid-shaped fleet through the magnetosphere — will first be looking to capture the process of magnetic reconnection as it happens in an effort to understand the basic physics, something that has eluded scientists since the dawn of the space age. To do so, each satellite carries 25 identical instruments that will provide a multi-dimensional view of the reconnection process as they gather identical data at four different points in space 10 to 100 kilometers apart. This is necessary, notes Torbert, because the area where magnetic reconnection occurs — the so-called “diffusion region” — is moving about 100 kilometers per second and passes by the satellites in just a tenth of a second. Together, the four satellites will be able to take a snapshot of this "action zone" and provide extremely precise time resolution of the process. Learn about the UNH students who helped with MMS.